Conscious Box promotes conscious shopping by allowing people to discover the most ethical and sustainable products on the planet every month. 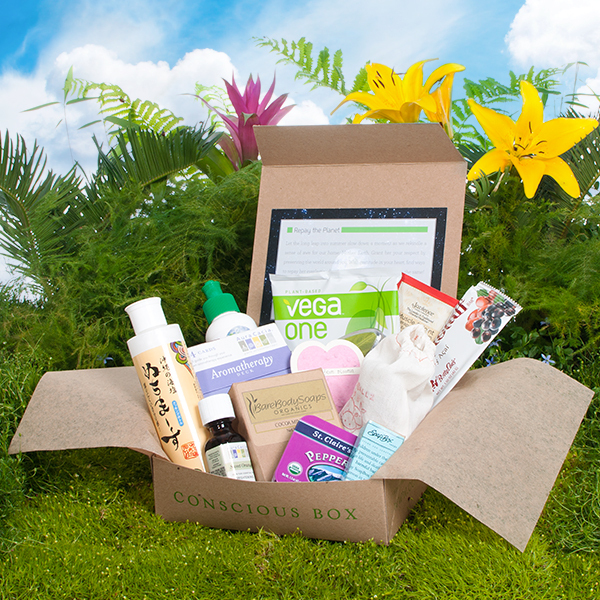 A subscription to Conscious Box gets you a variety of natural and pure products, from organic foods to vegan beauty products delivered straight to your door. Since product sampling is one of the best avenues for natural product companies to be discovered, they decided to start a fun service where consumers can try out sustainable and ethical products on a monthly basis. Each monthly Conscious Box also includes daily living tips. Customers can even earn points that they can use to purchase their favorite products in the full size version at discounted prices. The goal is to promote better, more conscious shopping by consumers. When asked why we should be “conscious” shoppers, Jameson believes “being a conscious shopper means more than just buying organic or following some sustainable trend – it means being aware and alert to how your actions and habits affect the world around you.” He notes that we live in a world of consumption. For Jameson and Conscious Box, giving backs means going beyond what we think are the normal things to do for our planet. Recycling, minimizing waste, being conservative with our resource use, be it gasoline or electricity – these are all things they believe we should do as part of a culture of giving back. Conscious Box is an active member for 1% for the Planet, a growing global movement of more than 1,000 companies that donate 1% of their sales to a network of more than 3,000 approved environmental organizations worldwide. They also provide charities with boxes for fundraising and work to set an example for other businesses and people to follow. A “better” way to do business. Jameson and his team at Conscious Box truly believe their efforts have had a positive impact on people’s lives and the wellness of the planet. They’ve helped raise funds for meaningful causes, from autism awareness to animal rights. They’ve helped support businesses that are making products that don’t damage the earth. Do you consider yourself a conscious shopper? I try to be.But sometimes I have to go with price because of my budget. But I do try to use as many natural cleaning products as possible especially since I have a well. It’s unfortunate that you often end up having to pay more for sustainable and ethical products. I hope these type of products become more of the norm in the future! Mac makes some great refurbished products. I recently had to replace a refurbished laptop that I had for years. Apple also has a recycling program, so I don’t have to worry about the disposal. There are so many considerations we should make when we shop. I’m learning more about how to make smart shopping decisions! It’s a really neat way to learn about new and ethical products! WOW. This is so convicting for me… I don’t think about what I buy enough… and yet, I really need to put my mind to this test more often and consider what I buy. Thank you for this eye opener!! Chris Carter recently posted..I Hear You… I See You. There’s certainly a lot to consider. I think the first step is knowing that your purchase can have an effect on the environment and people all over the world. Crazy, isn’t it? I love the growing popularity of these sample boxes. I get a Birchbox every month since I”m a beauty product junkie and I get to try products that I would otherwise not be able to afford. BUT Conscious box seems worth the investment for much more worthy reasons! Thank you! You’re welcome, Ilene. They do have lots of beauty products on the website as well!